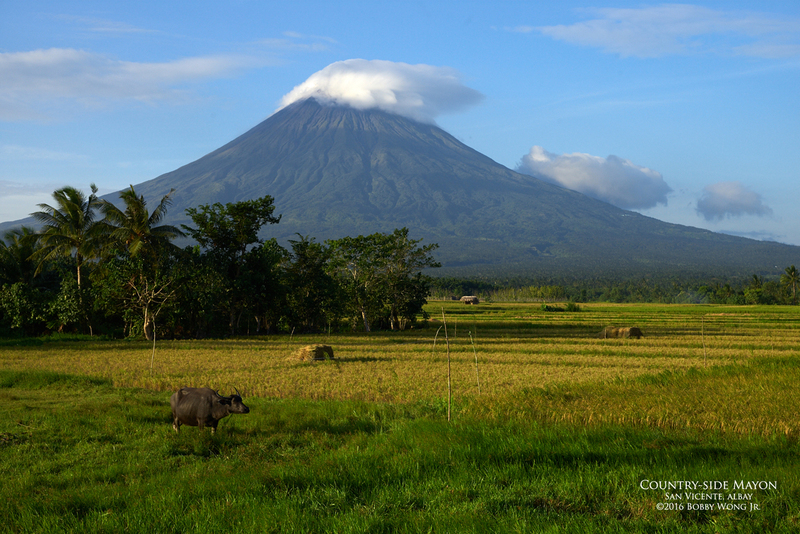 As a kid I'd seen photographs, even paintings of Mayon Volcano, with quaint rice fields and carabaos at its fore. I had always wondered if such a scene still existed, considering huge strides in population and progress since. But shortly after sunrise, while driving inland from the coast where we stalked dawn, we found exactly such a scene, and almost to the letter! We were in the town of San Vicente, a short drive west of Tabaco City in Albay. The morning was still young, with its golden light splashed across the landscape. In the foreground a water buffalo was grazing near a freshly-harvested rice field. On the horizon, Mayon's northern slope, convoluted with gullies, betrayed her power within. It was just a dream, but I had chased it down. Enjoy.